This bundle includes (4) items: "Uppercase Alphabet," "Crests," & "Lowercase Alphabet" glass etching stencils under brand name Over N' Over and 1 free How to Etch CD-ROM eBook with each purchase. Includes patterns for computer use only. 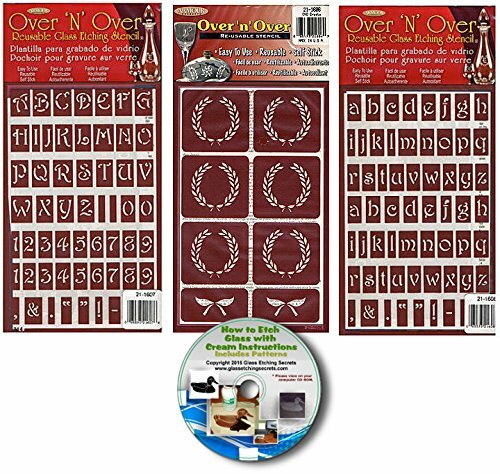 These reusable stencils are great for decorating your painting or etching projects. The package designs consist of the following for each size. Uppercase & Lowercase Alphabet: Narrowest letter- 1/8" wide, Widest letter- 1/2" wide, All letters- 5/8" high. Crests: outside: 1.5" x 1.50", Crests inside dim- 7/8" wide x 1 1/8" high, Bows-1.25" w x 5/8" h Each stencil can be reused between 15-20 times depending on the care of use give to the stencil. For use with Armour Etch Glass Etching Cream brand, Sand Etch kit by Armour Oh, by the way, did we mention that you can also use these stencils with water based paints and even body paints. Etch or paint stencils of letters or numbers on nearly anything easily! These adhesive-backed letters and crests themed stencils reduce frustration in having to cut and adhere them. Includes 78 total stencils of all letters of the alphabet, upper & lower case, numbers 0-9, punctuation marks & crests.